The H60 Wireless gateway from Husdata.se is a universal platform compatible with most popular ground source and air/water heat pumps manufactured by Bosch, IVT, Thermia and NIBE. The gateway is bridging the heat pump communication with Wi-Fi networking supporting various interfacing protocols and methods. One of the features are the integration towards the Husdata Online system. Husdata Online includes many features such as monitoring and analysis, remote heat settings, and alarm and notifications via email and SMS. A low cost subscription is required for this service. It also features MQTT protocol, Modbus TCP and API support targeting integrations with various smart home solutions such as the Home assistant system. The H60 has a built in Web interface with many features. Using the web interface you can manage and monitor the heat pump directly without any online or home automation system connected. 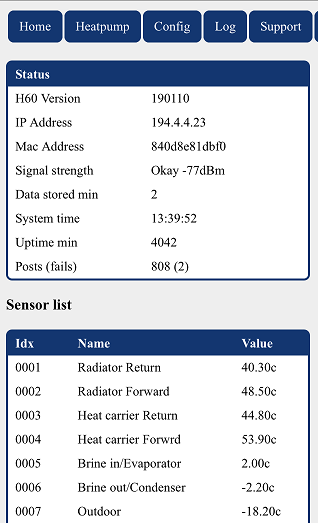 The web interface also have functions for troubleshooting, request support and update the firmware of the unit. The web interface are scaling for smart phones and full web usage. Finnaly the unit has an USB serial interface for advanced users.